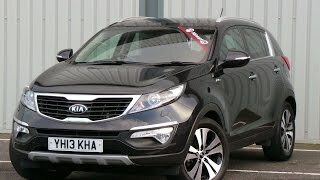 The new face lifted Kia Sportage KX 4 2013 destined to the European market is now available for order and it's time to see what will bring new to the table. Surprisingly enough, besides the mild changes in aesthetics and the new up-to-date technologies added in this year's model, the 2013 KX 4 also comes with a new engine type. The 134 horsepower engine usually found on other Sportage models has been replaced in the KX 4 with a more powerful 2.0 liter CRDi turbo diesel unit able to develop 181 horsepower and 282 lb-ft of torque from 1,800 to 2,500 RPMs when mated with a manual transmission, or 289 lb-ft of torque in the model featuring an automatic gearbox. Performance-wise the KX 4 is able to go from 0 to 60 mph in 9.4 seconds and reach a top speed of 120 mph when equipped with the 6-speed manual gearbox. Fuel efficiency is rated at 46.3 mpg UK and CO2 emissions are 158g/km. The 6-speed automatic variant has its top speed increased by 1 mph, but delivers lower fuel efficiency and produces more CO2 emissions. When equipped with the automatic gearbox the KX 4 can cover 39.2 mpg UK and emits 189g CO2 per km. In terms of standard equipment the KX 4 shines and offers a 6-speaker sound system alongside an external amplifier and sub-woofer, a 7 inch touchscreen full map navigation system, reversing sensors, parallel park assist system with front and rear parking sensors, advanced reversing camera display system integrated into the sat-nav screen, Bluetooth connectivity with voice recognition control, audio controls mounted on the steering wheel and USB and AUX ports alongside iPod connectivity. Other features include keyless smart entry system, stainless steel door scuff plates, start/stop system, full leather upholstery, tinted windows, Xenon lights, automatic lights and wipers, dual-zone climate control, panoramic sunroof, heated front and rear seats, cruise control and a new set of 18 inch alloy wheels. As far as pricing goes the new KX 4 is offered at the starting price of £27,195 for the manual and £28,500 for the automatic version. 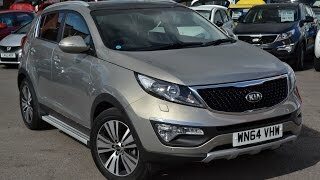 As before, in case the Kia Sportage KX 4 2013 is not exactly what you're looking for in a compact SUV, the list of alternatives include the Volkswagen Tiguan and the Ford Escape just to name a few.